Take advantage of privacy louvers and create a stronger sense of privacy on your commercial property. Privacy is typically associated with residential properties, as many of us don’t want peering eyes getting into our personal business. However, there’s a growing need for commercial properties to develop better security and privacy protocols. A big part of privacy is physical barriers, which can include traditional approaches like your average fence or something geared towards privacy in particular such as privacy louvers. Following are some of the biggest reasons that privacy louvers can benefit a commercial property. Louvers are large slatted fences made of aluminum typically, which allows for the transfer of sound or airflow and maintain an outdoors-feel but drastically reduce line of sight. Not only is this obviously appealing for anyone who wants to develop better privacy at a facility, but it’s also a big deal with security, which goes hand in hand with privacy. Privacy louvers are difficult to climb and obscure vision of what’s behind them, making the idea of breaking and entering far less appealing due to the reduced likelihood that a potential thief would even get anything out of it. Privacy louvers may be all about the functionality you get out of them, but they have the added benefit of making a property look much more professional. They’re sleek, modern, and curate an image that you care about security and privacy, which can do a lot for your personal branding. You may have customers or clients coming in who appreciate such an element to your facility and it can lend a whole lot into feeling like a unique space that isn’t something you see often. If you want to set yourself apart, privacy louvers may be the route. 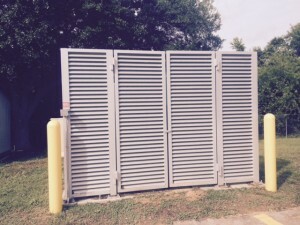 Privacy louvers made by Hercules are all 100% aluminum and maintenance free. This means you can rest easy knowing that your facility has an increased sense of privacy and that whatever you want to obscure is obscured. Taking advantage of privacy louvers is a big investment for your property that can come with numerous benefits that make such an investment worth it. This entry was posted on Friday, March 8th, 2019	at 2:03 pm	. You can follow any responses to this entry through the RSS 2.0 feed. Both comments and pings are currently closed.